Measurements:	4.52 x 3.86 x 2.85 mm. 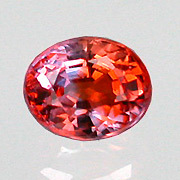 Small padparadscha colour. This piece has small area of bluish colour zoning.